JDialog class is used to create a top-level container Dialog window which contains a set of components like button, textfield, label etc. When a modal dialog window is active, all the user inputs are directed to it and the other parts of application are inaccessible until this model dialog is closed. When a modeless dialog window is active, the other parts of application are still accessible as normal and inputs can be directed to them, while this modeless dialog window doesn't need to be closed. 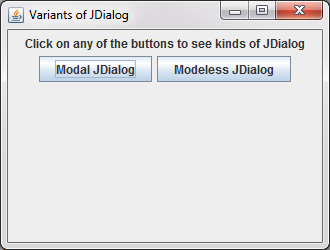 public JDialog() Creates a modeless JDialog window without a Frame owner or title. public JDialog(Dialog owner, String title) Creates a modeless JDialog window with a Frame owner and a title. public JDialog(Dialog owner, String title, boolean modal) Creates a JDialog window with a Frame owner, title and let's you define modality of JDialog window. An example of JDialog displaying Modeless and Modal JDialog windows. When you run the code, you are presented a window that shows an two buttons with show us two different variants of JDialog windows. When you click on the first button which says, Modal Dialog, you are presented with a Modal JDialog window which should be closed in order to continue with the program and click on the second button. 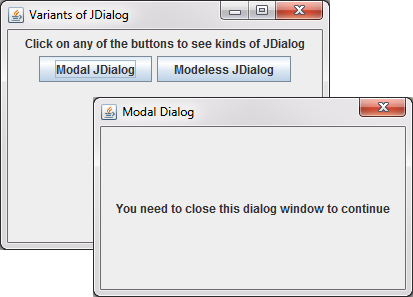 Hence, a model JDialog window blocks all the inputs from user to the window in its background, until it is not closed. 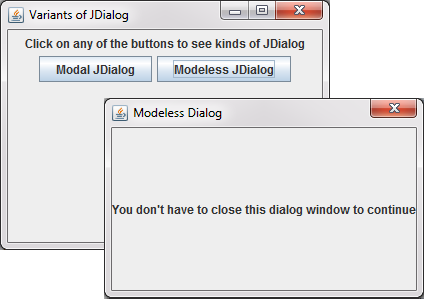 When you click on the first button which says, Modeless Dialog, you are presented with a Modeless JDialog window which need not to be closed in order to continue with the program and you may click on any button even when Modeless JDialog window on. Hence, a Modeless JDialog window does not blocks the inputs from user to the window in its background.